As a tea drinker, and I am sure this is true for you, I adore teaware, from bombillas to matcha whisks. Everyone has their favorites! This series showcases the favorite teaware of folks in the tea blogging community. Today's faves are from Cynthia Chovet, Tea Master & Manager of Stores at Palais des Thes USA. I love the shape of this antique Art Deco cup and saucer, made by the Salem China company in the late 1930's! It's a pattern called Streamline and the gold bands are 22k, which makes it all the more precious. I found a large set of these while I was hunting at the fleamarket and think that the size and feel of the china is perfect for drinking tea! Not to mention, it's nice to get a little fancy occasionally! This is my go-to filter, as most of the time I make tea by the cup. Simple to use and easy to clean, it has a fine enough screen to keep tea leaf dust out of my cup! My husband brought this Chinese cup and lid from France when he moved to the United States. I adore the dragon motif and the lid is practical, keeping my tea warm when I get up from my desk! I fell in love with this teapot the moment I saw it! 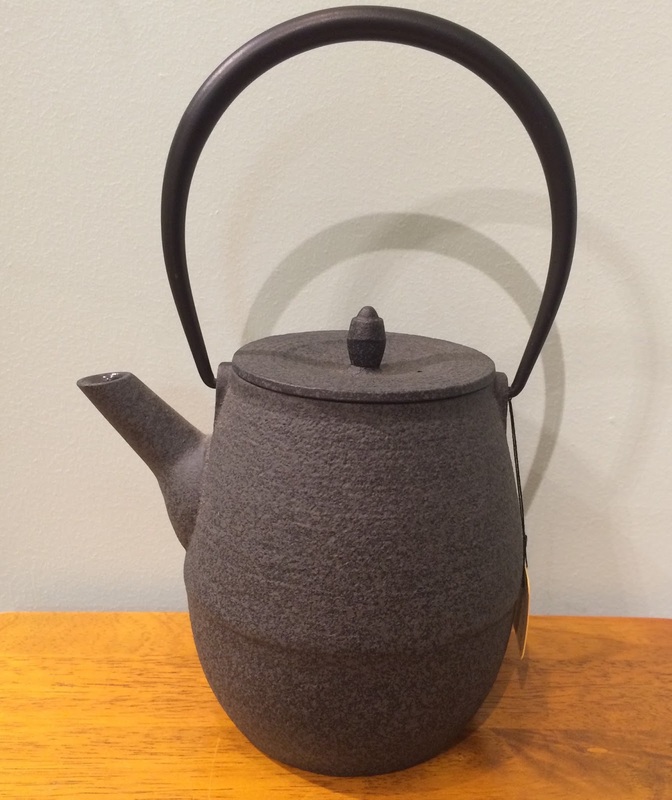 This is Palais des Thes' Gray Natsume cast iron teapot, made by the famous Japanese designer, Hisanori Masuda. I love its purity of form and the fact that it's cast iron lined with enamel. It's perfect for when I entertain guests and coordinates well with other midcentury modern pieces that I have. Cynthia skillfully and knowledgeably hosted a tasting of Palais des Thes Grand Cru teas. I am pleased that she agreed to participate in this series. Thank you, Sara! I enjoy reaching out to tea folks and learning about their favorite objets de thé. Delighted to see these favorites from Cynthia--she's a treasure trove of information and always a joy to chat with at the Palais des Thes shop! I'm mooning over the dragon-motif cup with lid--such a sweet touch. The pattern and colors on that cup are fantastic, Rachel. Love this post! My mom actually has the exact same dragon teacup that your husband brought over from France. And as a gift 2 years ago, my sister gave me the Palais des Thes Natsume teapot in blue (it's the same one in my blog's header). I can see how that filter would do a great job separating out any unwanted fannings...love it when you can use something antique that's even more practical than modern day creations! Great minds think alike -- you and Cynthia favor the same Palais des Thes Japanese teapot!